Select the above photo to be taken to a page with full details, and further photos, of the service of Private Appleton in the Yorkshire Regiment. Born on 25 May 1891 in Skelton-in-Cleveland. 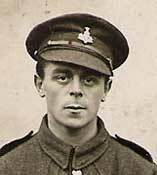 Enlisted into the 4th Battalion Yorkshire Regiment (Territorial Force) on 22 February 1913. Served with the 4th Battalion throughout the First World War. Promoted to Lance Corporal in April 1917. When the War ended he was demobilised, but in 1920 rejoined the 4th Battalion as a Private and served with them until 1927. For full details of Fred Appleton's biography and service with the Yorkshire Regiment, together with further photographs of Fred and groups of fellow soldiers in the 4th Battalion, please select the link below. The page with biographical details of Fred Appleton also includes letters sent home from the trenches, and a poem written during the War. We are extremely grateful to Fred Appleton's grandson, Peter Appleton (<peter.appleton3@ntlworld.com>) for providing us with all the photos and biographical details of his grandfather.